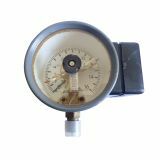 Gauge, analogue Ф160 x 110mm, 0-160kgf/cm2, 0-10V Analogue manometer 0-160kgf/cm2 - from 0 to 10 V, ф 160 x 110 mm. 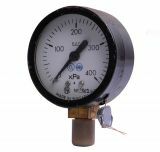 Gauges are devices used for measuring the pressure of gases and liquids. They are divided into several groups. 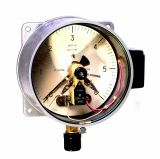 One of the most used group are indicator gauges which only show the pressure in a specific node of the system. 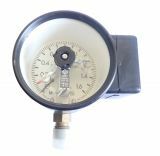 The second most used group are contact pressure manometers which also show the pressure, but are able to maintain a certain amount within a certain range. They have an adjustable upper and lower limit and each of them is linked to a contact system, which switch on or switch off a mechanism in order to achieve the specified two levels of pressure. Their most common application is in craft and devices which are working under pressure such as steam systems, air conditioning systems, boilers, etc..